Sunday is starting out dry and warm with low temps around 80. The day will stay dry for the first half, with temperatures quickly warming to near 90. The sea breeze will kick in later in the afternoon and bring the chance of showers and storms to the east coast later in the day. Plan on a 40 percent chance of showers and storms later in the afternoon, with heavy rainfall at times. 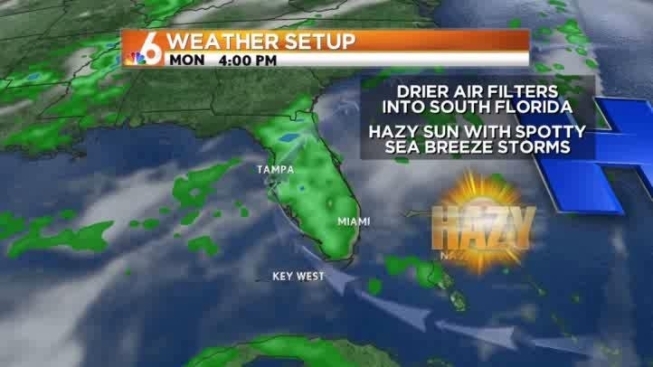 By Monday, drier air will settle in, lowering rain chances slightly. There will be hazy sunshine, with a 20 percent chance of showers. For most of the work-week, plan on typical weather – morning sunshine, with afternoon storms. Highs will remain in the low 90s.